Our system automatically constructs simple "pop-up" 3D models, like those one would find in a children's book, out of a single outdoor image. 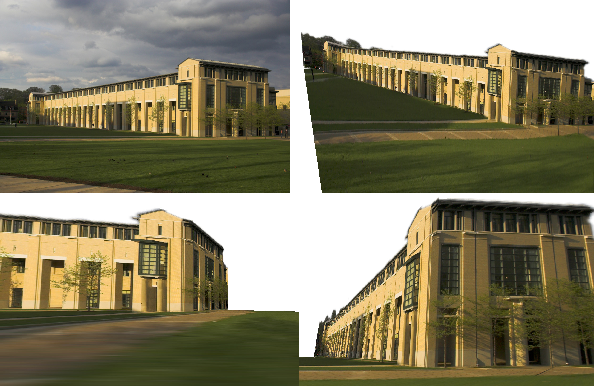 The labels each region of an outdoor image as "ground", "vertical", or "sky". Line segments fitted to the ground-vertical boundary in the image and an estimate of the horizon's position provide the necessary information to determine where to "cut" and "fold" in the image. After cutting and folding, the model is popped up, and the image is texture mapped onto the model. Derek Hoiem, Alexei A. Efros, Martial Hebert (2005). Automatic Photo Pop-up. ACM Transactions on Graphics / SIGGRAPH, 24(3).